If you get a chance to be in Dublin any Wednesday until December18th, there is a weekly, free concert, of singers singing Child Ballads in the National Library, Kildare Street, Dublin 2. Open to all. One song which has popped up a few times recently, with different interpretations, is the Death of Queen Jane, a Child ballad (#170). The song is believed to be about Jane Seymour (c. 1509–37), Henry VIII's third wife - one of only two of his six wives he neither divorced nor beheaded. She gave birth to a son, Edward, who briefly become King, Edward VI of England and Ireland, before his early death in his late teens, when his older sisters, Mary and then Elizabeth, took over. There is no historical evidence for any Caesarian section being carried out on Jane during her labour and Jane was well enough to receive visitors after Edward's birth. However, she fell ill within a week and died 12 days later. 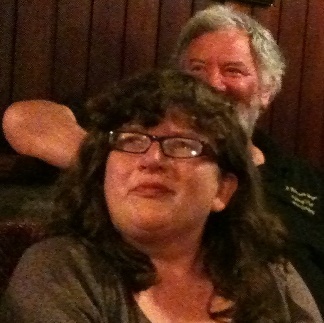 Helen Grehan sang a beautiful version the other night, to a different tune than that usually heard. Daithí Sproule composed a tune for it in the early 70s and this is the version the Bothy Band and Mícheál Ó Domhnaill recorded on their Afterhours album.This is also the version in the new Coen brothers' film: Inside Llewyn Davis, although that film is about a folk singer in Greenwich Village in 1961, before the tune was composed. Will you open my right side and find my baby? And hear what he may say"
Your eyes, they look so dim"
"King Henry, King Henry, will you do one thing for me? The Sligo Traditional Singers' Circle held the Frank Finn Traditional Singing Weekend, from Friday 4th to Sunday 6th October 2013, at the Yeats Country Hotel, Rosses Point, Co Sligo. This year, one of the special guests was Boyle's Breege Duffy. Breege and her brother Hughie gave a talk about Josie McDermott on the Saturday evening. Another Josie, Josie Sheáin Jeaic Mac Donncha, directed the singing workshop and his powerful sean nós singing was heard several times over the weekend. Rosses Point is a beautiful setting for this singing fest, long may it continue. On the eve of the All Ireland Dublin / Mayo clash, some of the singing was distinctly partisan, with Dicey Riley taking on the Mayo supporters in the other corner. Ah, the heart of the rowl is Dicey Reilly. We don't encourage that class of thing at all. At all. 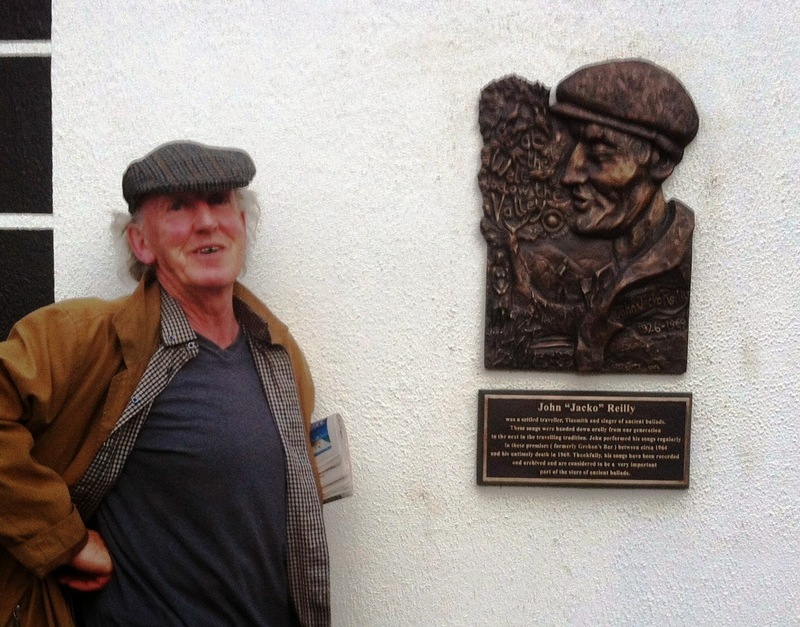 The Frank Finn Traditional Singing Weekend will be held this year from Friday 4th to Sunday 6th October 2013 at the Yeats Country Hotel, Rosses Point, Co Sligo. 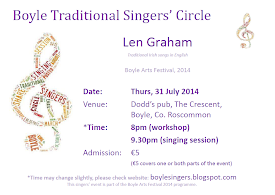 A great weekend of singing has been lined up once again by the Sligo Traditional Singers' Circle. 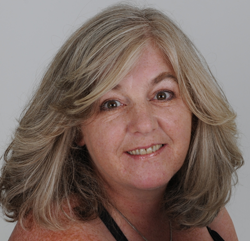 This year, one of the special guests is Boyle's Breege Duffy. The weekend's programme is varied and includes a trip to Coney Island, Breege and her brother Hugh on the Bard of Coolmeen, singing competition for the under 13s on the Sunday, and many, many singing sessions. Sing under Boyle Abbey's new glass side aisle. Boyle Traditional Singers' Circle present traditional singing in the Abbey cloister. All singers, storytellers and listeners welcome to sing under the new glass side aisle. Contact Address: Boyle Abbey, Boyle, Co. Roscommon. 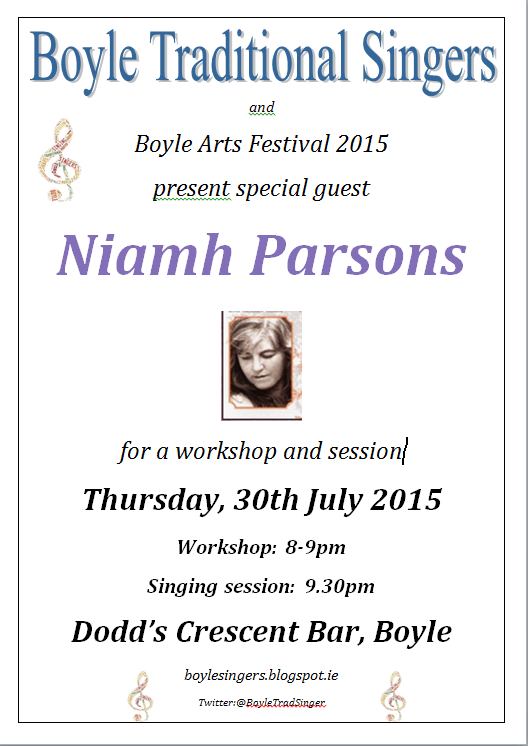 There was a lovely session with Róisín White in Dodds on August 1st. Róisín led the gathered crowd in an impromtu pre-session session and also sang through a couple of songs with the group, including jogging along to Claudy on the Sour Milk cart. The scene was set for a very full night of singing with Breege performing the Bean a' Tí role. We were glad to see friends from Sligo and Knockcroghery there as well as visitors from Carrick, Strokestown, Drumkieran and Dublin. 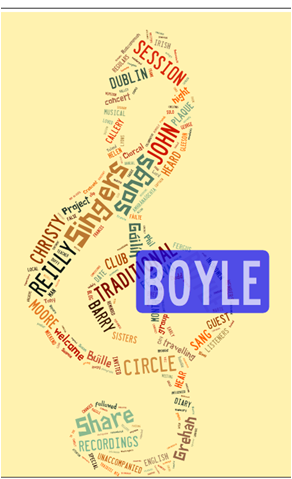 Boyle Singing Circle is delighted to welcome Róisín White to Boyle. Róisín White is originally from Co. Down. Her style of singing has been variously described as 'punchy', 'jaunty', 'direct', 'no nonsense', 'engaging' and 'seductive'. The majority of her songs (in both English and Irish) are from the northern tradition. She has collected, and made her own, songs sung by many renowned singers including, Len Graham, Paddy Tunney, Robert Cinnamond and her great friend, Sarah Anne O'Neill. She has two albums to her name: The First Of My Rambles and With Thanks/Le Buíochas. 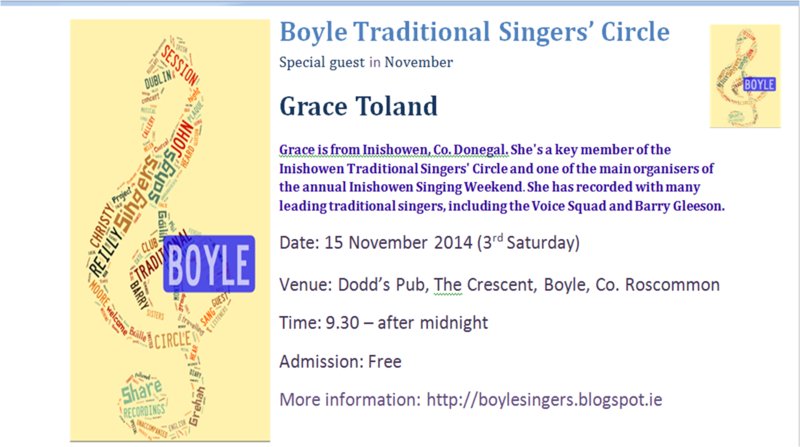 We look forward to hearing Róisín and all other singers tomorrow night in Dodds. July cominatcha already.Singing and straight into the Joe Mooney in Drumshanbo, where there'll be loads more. A quiet gathering in May - unusually held on the 4th Saturday instead of the 3rd. Back to the 3rd Saturday from June. Dark-eyed gypsies, the military, shot dogs and horsemeat, last Saturday in Dodds. The Bonny Light Horseman, this version I do believe, (Brian Leahy instead of Phil Callery in this 1983 recording). The blog writer can't be every where and was absent nearer to where Kevin was singing about: Cavan and Thom Moore's Cavan girl. From around the same time as the Scholar or the Train to Sligo - which nobody sang the other night. But the most important thing ... Brian and Eileen are back! Gather up for next month, May, and remember the change of date, for the month of May only, the FOURTH Saturday instead of the third. An lá roimh Lá Fhéile Phádraig. Slua maith ag an seisiún, mar is gnách. Amhráin as Bearla agus as Gaeilge. bhí cuideacht' álainn lem' ais ag ól. A súil mar an áirne, 's a grua mar snó. A scríobh a lán is a léigh go leor. Is é ba mhéin liomsa 'theacht im threo"! Ar aghaidh linn go lá Valentín. Beidh an lá sin thart, fán am go gcastar ar a chéile sinn arís, ar an 20 Aibreán, ach b'fhéidir go mbeidh an grá seachas an ghruaim san aer? February began with Breege singing a lovely version of Matt Hyland. I grabbed these lyrics from Mucat.org, I hope they don't mind. You can find some more information on it online at the English Folkdance and Song Society, the Vaughan Williams Memorial Library , where it has a Roud (index) number, 2880, as there are so many versions of it. Sometimes the title is Matt Ireland, sometimes Matt Highland, and sometimes Matt Hyland. It's a song that has been collected in Ireland North and South, in England and in the US. I wish to God I'd gone before you"
Just like some poor forlorn stranger?" I'll wait for you my Young Matt Hyland"
Since there are none you style above him"
A gentle beginning to 2013. Boyle singers in good voice and Clare took up the "Twas in the month of January" challenge beautifully. Jim Bainbridge and Jackie Boyce's Drumkeeran singing session will be happening this coming Sunday, 6th Jan. Sing in the New Year in Forde's Pub from 5pm. We had a night by the fire, both inside and out. Some Christmas songs in Dodds and some more outside, at the end of our night, singing at the bonfire on the Crescent where the Boyle Sleep Out 2012 was taking place, in the wind and the rain. Fair play to them.